The world's best iron player isn't named Adam or Rory. New research reveals that it's none other than Sergio Garcia. The Spaniard's ballstriking secret? The unique way he moves his left shoulder from address through impact. Now you can learn his simple shoulder shift to launch solid iron shots that never leave the pin. I spent months breaking down the left-shoulder movement of Garcia—and that of other elite players—and came up with a new, easy and effective way to swing. I call it the Pull Back, Run Up and Jump (photos, below). In the ideal iron backswing, the left shoulder doesn't just move back, as you've been told; it moves back, down and out. On the downswing, it doesn't just move forward; it moves further down, then under and around the position it held at address. If you ignore this pattern, you rob yourself of dynamic motion and speed, which may explain why your swing often feels unathletic and weak. Enough of that! Steal Sergio's secret and start puring your irons like a pro. Pull your left shoulder back and down as far from its original position as possible to produce pure power. Loading up like this gives you extra space and time to generate speed on your forward-swing. A tip: Don't turn your shoulders flat or strand pressure on your left side..
Move your left shoulder back and down on your backswing, then forward and farther down, before whipping it up and behind you. Key move: Shift pressure to your right foot, then to your left. STEP 1 - Just before you start your swing, shift pressure to your left foot, then use this "forward press" to shift it back to your right foot as you take the club away. Basically, you're pushing off the ground with your left foot to move your mass toward your right foot. Once you feel pressure under your right foot, use it to push upward toward your right ear. 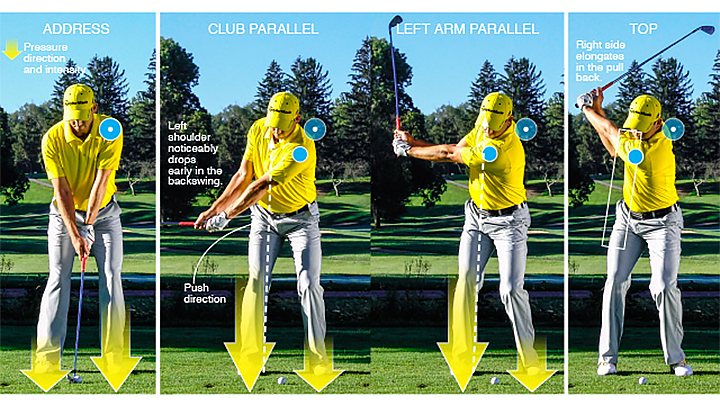 This upward push instantly gets your left shoulder moving back, down and out, like Sergio's. STEP 2 - Maintain pressure under your right foot and continue pushing upward toward your right ear, getting your left shoulder to work even further down, out and away from its original starting position. You're doing it correctly if you feel like the right side of your torso (from armpit to waist) is "elongating," and that your belly and chest are pushing away from the target at about the time your left arm reaches parallel to the ground. 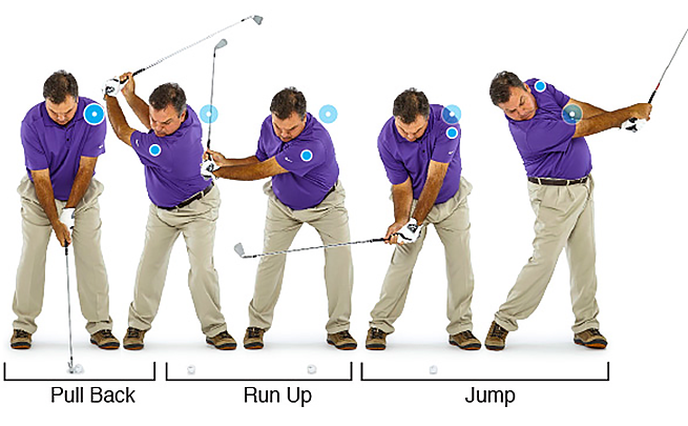 Swing to the top, then take your left hand off the grip and allow your arm to fall. Let gravity do the work. 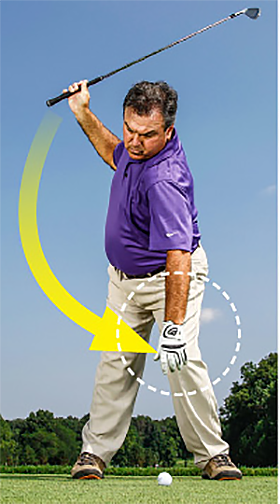 You've made a successful, Sergio-like pull back if your left hand hangs even with and slightly to the right of your left knee as you look down. If it hangs to the left of your left knee, you didn't pull your left shoulder back far enough; if it hangs above your left knee, you didn't drop your shoulder low enough. That's just past the middle of your chest when you stand in your address position. In the players we studied, most got here with 40 degrees of hip turn and 85 degrees of shoulder turn, numbers that any golfer can reach. If your coach says, "Turn your left shoulder into your chin," fire him! In elite golf swings, the left shoulder drops to the approximate level of your sternum as you stand at address. Very few everyday players get this low. Students fight me on this position, but it's where you want to be. Prove it to yourself right now. As you sit, turn your shoulders to the right. As your right shoulder moves behind you, your left shoulder goes out in front of you.